Alison Kerby’s guesthouse is already crowded with spirits. The last thing she needs is a whole new batch of haunts settling in. As Alison’s reputation as “the ghost lady” grows, so does her business—and not always in a way she’d like. Tourists may be flocking to her guesthouse for a chance to glimpse her resident spirits, but her special abilities are also bringing unwanted private investigation cases to her door. And she has no choice but to take a case when the local homeless man is found murdered under mysterious circumstances, just hours after asking for help in exorcising a specter. E.J. 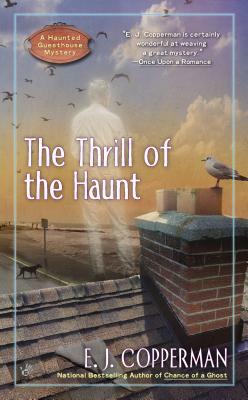 Copperman is the national bestselling author of the Haunted Guesthouse Mystery series, including Chance of a Ghost, Old Haunts, An Uninvited Ghost, and Night of the Living Deed.